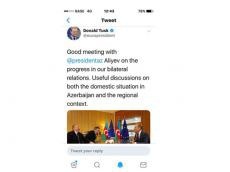 The European Union officials have tweeted about the Azerbaijani President Ilham Aliyev’s meeting with the President of the European Council Donald Tusk in Brussels and the conclusion of the Partnership Priorities document. In particular, Tusk himself sent a tweet about fruitful talks held with Azerbaijani president. “Partnership Priorities between the EU and Azerbaijan reinforce the bilateral agenda,” press secretary of the European Union's foreign affairs and security policy also tweeted.